Contains accurate and extremely clear guitar transcriptions, comprehensively notated in tablature. 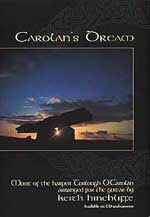 Includes arrangements of all the tracks on the Carolan's Dream CD. A must for anyone wanting to learn how to emulate Keith's haunting arrangements of O'Carolan's work. Listen to the clips below or try out the arrangements for yourself by looking at the free tab of Hewlett from the book.